From Warm and Earthy to Cool and Modern, These Color Palettes Are in Right Now! Not Sure What Color(s) to Use in Your Bathroom? Try One or More of the Following! From warm and earthy to cool and modern, these hip color palettes are sure to transform your bathroom from boring to brilliant. If you're looking for a bathroom remodeling company to help in your bathrooms transformation, give Creative Bath Systems a call today - 330.467.2227! Deep, moody green interiors are taking the design world by storm, and bathrooms are no exception. Consider a hue like hunter, olive, forest, jade or emerald for the walls, and balance its intensity with natural wood and jute accents. Matte black fixtures and ceramics complete this look. The trendy palette works well with rustic, modern farmhouse and Southwestern design styles. This ultra-popular look pairs warm with cool and crisp with soft for a totally fresh feel. To get the look in your own bathroom, start with a bright, white backdrop, and mix in sleek, black lines. Soften the high-contrast palette with muted wildflower hues like dandelion yellow and dusty rose. Ground your space with Moroccan tile to help establish a bohemian vibe. Layer in warm textures — think natural materials like wood, jute and rattan — to tie the look together. Moody and saturated green-blue hues are hot this year. Pair a teal focal piece like a tub or accent all with varying shades of dark and light blue, brown and tan and finish with soft linen accents. A lovely complement to weathered wood, antique metals and handwoven accents, this calm, muted gray-green hue is a top choice among farmhouse-style design fanatics. Subdued colors not your thing? Go bold with fresh, young color like this poppy coral paired with black and mint green accents. If you're growing tired of your all-white bathroom, but aren't quite ready for a full remodel, simply freshen it up with natural, golden wood and antique-inspired metallic elements. This delicate yellow hue evokes cozy cottage charm and pairs beautifully with vintage and rustic elements like this claw foot tub and distressed foot stool. To complete the French Country aesthetic, designer Sarah Richardson chose curtains and other decor in dainty floral patterns. Think swirling ocean waves beneath a stormy, gray sky, and you’ve mastered the feel of this color scheme. It’s all about choosing calming, ocean-inspired blues and cool, icy grays. Balance those tones with a bright white for a space that feels equally relaxing and energizing. Leafy houseplants bring organic texture to this palette. This smoldering hue is a refined take on the dove gray bathroom trend, and we are smitten. Pair with weathered metallics, natural greenery and subtle texture like grass cloth wallpaper for a sophisticated look. Gone are the days of stain and paint overload. 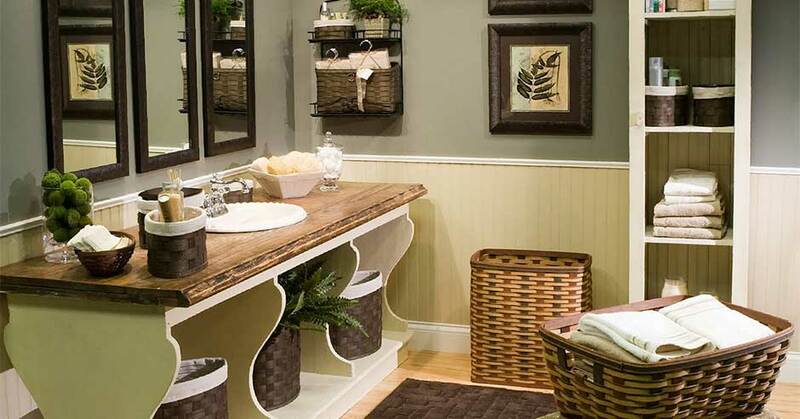 Natural wood is in, and this color scheme is all about accentuating the beauty of wood grain. Balance the rich, warm brown tones with soft, creamy whites or pastels. While this palette pairs effortlessly with a rustic aesthetic, it can also pair beautifully with a contemporary design. To add interest to the soothing scheme, choose mixed metals for fixtures and hardware. Indigo blue pairs with pure white to create this striking color palette. Bold, large-scale patterns and tropical houseplants bring the look to life, while brass fixtures and hardware add a modern feel. This pretty mid-century staple is back in a big way. Go totally vintage with classic square pink tile or take a new approach by pairing modern glass tile with sleek chrome and porcelain accents. Establish a dark, dramatic gemstone color like black onyx for the base of this palette. Accent with vibrant jewel tones like peacock blue and raspberry pink. The overall design should feel funky and eclectic, so don’t be afraid to embrace bold patterns and over-the-top textures like tassels and fringe. Perfect the look with global accessories and warm-toned metals. Terra cotta is making a major comeback, and your bathroom is the perfect place to embrace the trend. With proper sealing, Terracotta tiles can be used for showers and floors alike. Pair the natural tile with other earthy, clay-hued tones, and offset the warmth with matte black. Tribal-patterned accents will play up the desert vibe, while modern shapes and silhouettes will ensure the color palette feels fresh. Channel seaside vibes by mixing light sea blues with hints of coral, white and natural green. This sleek, edgy color palette employs various shades of gray to create interest against a crisp, modern white. The combination feels clean and refreshing, ideal for a bathroom. You can carry out the look in countless ways; just keep three-fourths of your space white and one-fourth gray. Choose clean-lined silhouettes and smooth, high-gloss finishes. Houseplants are a welcome addition, as they add a touch of lively color to the otherwise neutral palette. When paired with white Carrara marble tile and brushed gold hardware, this energetic green hue turns a plain Jane bathroom into a show stopper. Up the prep factor by choosing rugs and shower curtains in a bold-patterned navy and white. Forget boring neutrals. This combo of earthy desert tones and dusty gray hues oozes interest. To achieve the feel, pair cool concrete floors, walls or counter tops with warm wood accents. Soften industrial elements with natural accessories like a jute rug, wicker basket or macramé wall hanging. Add glamorous drama to a plain white bathroom by painting the vanity black and trimming with gold accents. To soften the look, opt for soft gray floor tile and keep accessories neutral. Ready to get started now? Just call Us: 330.467.2227 or Contact us for a FREE quote!